An artist's depiction of a Quasi Stellar Object. 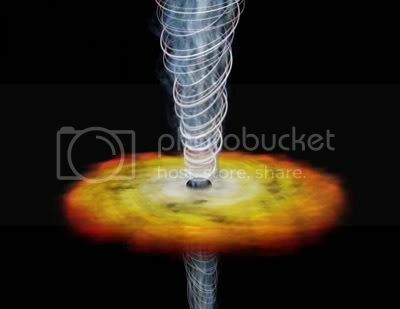 The accretion disk surrounds the galactic core emitting powerful jets of photons from the poles. The purpose of the Alpha Dot Project is to use the increased calibration of the HIRES1 to calculate a more precise variation in alpha2. Light from a distant QSO3 has absorption lines "frozen-in" as it travels through clouds of gas. The data used by Murphy et al.4 was calibrated using Thorium-Argon absorption lines. Using Iodine we hope to exploit the much higher number of absorption lines to increase the accuracy of our data. By comparing the location of absorption lines if alpha were constant to the "frozen-in" data we can calculate a possible shift in alpha. Many different splines5 fit the Iodine data rather well verifying their robustness6. The main problem in the analysis is that the shear number and strength of absorption lines from Iodine makes it difficult to isolate some of the "frozen-in" lines.